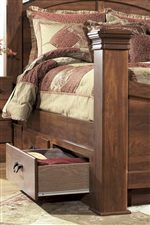 The Timberline Queen Poster Bed by Signature Design by Ashley at Crowley Furniture & Mattress in the Kansas City Area: Liberty and Lee's Summit, MO & Overland Park, KS area. Product availability may vary. Contact us for the most current availability on this product. 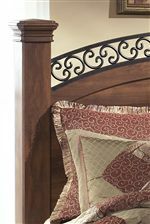 000026316470 Queen Poster Headboard Panel 1 54" 2" 37"
000026316330 Qn/Kg Poster Headboard Posts 1 8" 8" 61"
The Timberline collection is a great option if you are looking for Cottage furniture in the Kansas City Area: Liberty and Lee's Summit, MO & Overland Park, KS area. 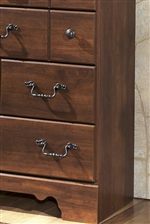 Browse other items in the Timberline collection from Crowley Furniture & Mattress in the Kansas City Area: Liberty and Lee's Summit, MO & Overland Park, KS area.